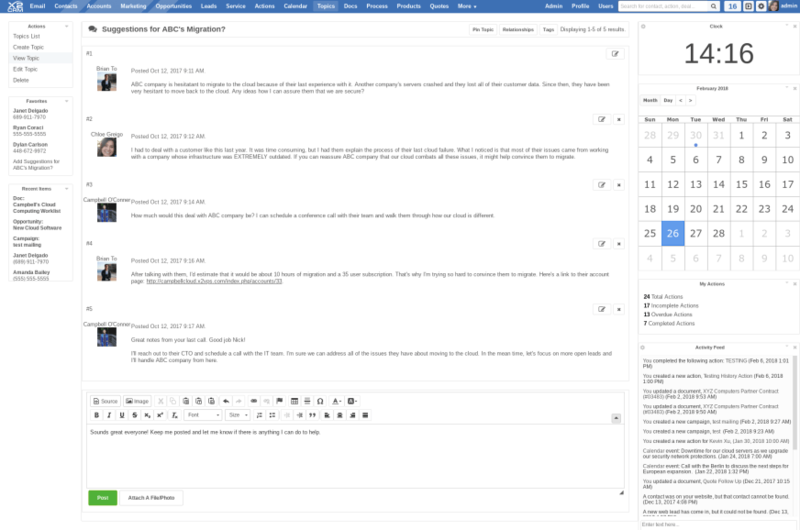 Topics provides an internal place to create forums for discussions. It’s the perfect platform for users to chat and answer internal questions. The main screen of the Topics module contains a list of the current Topics available for comment. The list view displays the Topic name, the creator of the Topic, the date it was created, and how many replies it has had. To create a new topic, click the “Create Topic” action from the left-hand action menu or from the dropdown hover menu. The name of the topic refers to what will be displayed in the list view of the Topics module. Any text filled in the body of the text editor will be displayed as the first post of the topic. Any files or media you upload during creation will be attached. To comment on a topic post, simply scroll to the bottom of the thread to find the text editor. Fill out your comments and click “Post”. Your text will appear as the most recent comment in the topic.